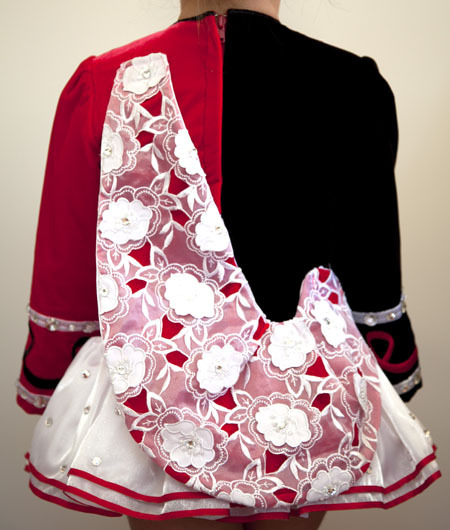 Centre front neck to dropped waist: 14½"
Centre back dropped waist to hem: 7"
Total back length (top of zipper to hem): 21"
Half black velvet, half red velvet bodice and sleeves, with bright red and white asymmetrical embroidery design. 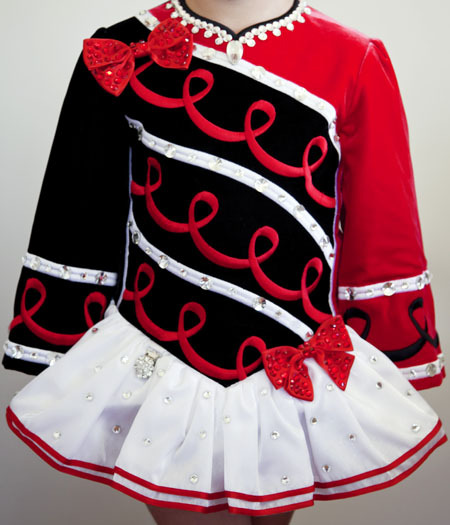 Adorable red bows with red Swarovski crystals highlight the asymmetry of the design. Modern style skater skirt constructed from white twinkle satin with red ribbon edge. Shawl constructed from red velvet with white cut-work lace overlay. Hundreds of Swarovski crystals in various shapes and sizes for added sparkle. Very good condition. Worn only 4 times.